Another Romeo and Juliet. Another modernised Romeo and Juliet. Everybody knows what to expect, everybody has seen it any number of times and everybody loves a Leonardo. Is there any point staging yet another version of arguably the most famous play of all? 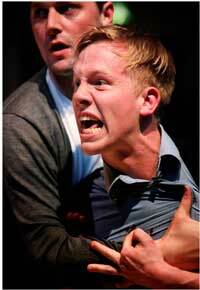 Burgeoning company Black Rat Productions scream a resounding ‘Yes’, and they aint half right. The fresh feeling to this production doesn’t stem from the use of mobile phones, helicopter search parties or humanoid robots from the future; but rather an absolute understanding of the text – it’s relevance and the impact that it should have. That’s the modernity. The scene in which Romeo lays with Juliet ahead of his banishment, initially in silence aside from two cast members singing a haunting melody, is exquisitely played and universal in theme. The Capulets are as dangerously aggressive as anyone of the Chatsworth Estate, and Richard Tunley’s absolute wrath shown to Juliet when disobeyed is uncomfortable and real to watch. Tunley, who shares the direction with Gareth Bale, overwhelms the stage with people, noise and violence when required, but with skill and dexterity and without ever detracting from the main plot. The subplots we see with the amount of characters on stage at these points elevates the threat of the Fate that watches over them, and the relentless pace of scene changes, snatches of music and sheer volume of the fight scenes, overseen by fight director Sam Davies, serve to make this memorable production one of the most authentic experiences in the theatre that I’ve had. Black Rat’s company website says that it seeks to use established acting talent alongside the emerging, and with the exceptional casting they prove the validity of their policy. Rachel Ford is an incredibly authentic Juliet. The sheer bliss that washes over her when Ricky Smith’s Romeo enters her life, is beautifully juxtaposed to the absolute dejection when seemingly forced to marry against her wishes and deal with the crushing onslaught from her Father. The two leads do extremely well to make the piece accessible with the passion that underscores their every utterance; everything understandable because of the conviction behind it. The rest of the cast are exceptional in their support, including Gareth Bale’s wonderfully camp, confident, dangerous Mercutio and his interplay with Tom Mumford’s much put-upon Benvolio. With not a weak member amongst them, Black Rat’s superb production is in complete command of the text, knows exactly where it wants to go with it and makes damned sure the audience follows. Not just another Romeo and Juliet; this feels new, and Black Rat Productions are a company I plan to see an awful lot more of.